Union Public service Commission or UPSC is the main organization responsible for conducting civil service examination in India. The exam also known as IAS exam is conducted in the month of June every year to select the most talented and bright students of the nation for the most prestigious posts in India. The admit card for all the exams are released separately. Students need to study really hard to crack the civil services. The online application filing process will start in February 2019 and later on by first week of May, admit cards will be released for the prelims only for those candidates who have submitted the application in the desired format. Make sure that you download the admit card and take a printout of it. All the aspirants may also keep a note that no admit card will dispatched via post. The preliminary exams for the year 2019 will be conducted on first week of June, whereas Mains exam will be conducted by last week of September. Candidates who have applied for CSE 2019 exam can download their e-admit card by logging in the below given link. i.e. http://www.upsc.gov.in/. The link will activated by first week of May. E-Admission card will be issues 3 weeks before the examination date. Separate admit cards are there for both Mains as well as preliminary exam. Candidates have to fill the form properly and after paying the free online. They are eligible for online processing and after verification one can download the admit card. Candidates who have applied for IFS 2019, will be able to download their admit card from first week of November onward. The IES exam will be held in July 2019 so, the admit card will be released by first week of June. An e-admit card/ hall ticket/ call letter is required for UPSC Civil Services Prelims, UPSC Civil Services Main -written Exam and UPSC Civil Services Interview. For the UPSC prelims examination 2019, the candidate need to carry a black ballpoint pen, a clip board to hold the question paper, admit card and a valid ID proof (Aadhar card, driving license etc.). the students need not to carry any rough sheets, these will be provided in the examination hall. The student should not have any electronic device (even a Smartphone in switched off position), else the student will be considered disqualified. The admit card or E-call letter for the mains examination (last week of September to October) will be released over the official website upsconline.nic.in. All the candidates who have cleared the prelims and have submitted the detailed application form (DAF) for civil services 2019, will be able to download the e-admit or the call letter card for the official website page. Click on the given button or icon of e-Admit card. Then click on UPSC various examinations e-Admit card. Now click on the button/icon “Click Here”. Read the instructions carefully and then click on the link “Yes”. 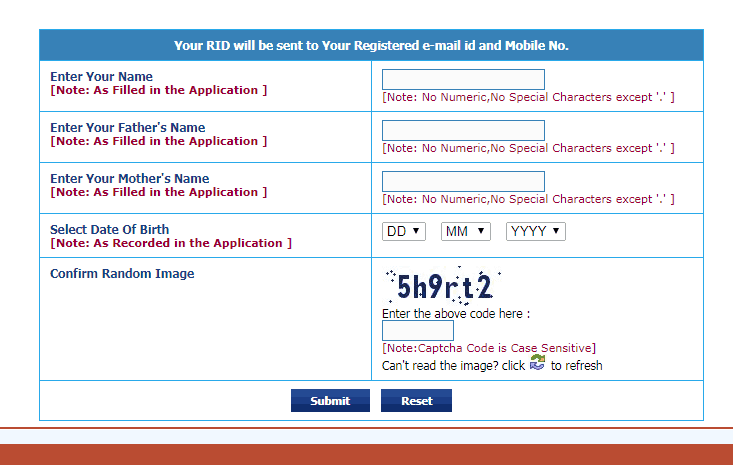 In order to download your e-Admit card, click on By Registration Id or By Roll Number. Enter the appropriate information as selected in step 6. Last step is to download the admit card and take print out of the same for future reference. This admit card works as a gate pass and your attendance verification inside the hall. The admit card of UPSC exam contains the details like roll number, centre of examination and examination timings which are assigned specifically to every candidate. Separate admit cards are assigned by UPSC Commission for prelims and main examinations. No admit card or admission certificate will be sent to candidates by post. After downloading the admit card, one must verify all the details given in the admit card and any discrepancy must be notified to UPSC immediately. Error occurred in name, roll number or any other important information can cause a problem which will affect your examination. Every candidate must bring their e-admit card in the printed version in each session in order to secure admission to examination hall. E-Admit card must be preserved till the declaration of written result as senior authority can demand for your admit card as a proof. Never share your e-Admit card with any one as your admit card can be misused in any manner. Your e-admit card is your sole property. You have to appear at the same centre and timings of examination as described in admit card otherwise your candidature is liable to be cancelled immediately by the service authority. How to regain the forgotten registration ID or roll number for UPSC admit card? Click the ‘Forget RID? – click here’ icon/button to obtain registration ID. Then enter your name, father’s name, mother’s name and date of birth, registered email id along with the Captcha security code. Registration ID will be sent to your registered e-mail id and mobile number. As soon as you download the admit card, cross verify all the details. UPSC gives a chance for correction of data, before three weeks of exam. If any mistake is found, it should be reported to the UPSC as soon as possible. You can get more information in this regard from facilitation counter in commission’s office. You can contact them personally or by placing a phone call from the number provided in the official notification. One can call over telephone numbers as 011 ‐ 23381125 / 23098543 / 23385271 specifically on working days between 10:00 AM till 5:00 PM. The Commission’s Website has address as http://www.upsc.gov.in, where candidates can obtain the details of examination or one can submit the queries regarding their candidature. For IAS, IFS, IPS and other group A posts, a candidate must be a citizen of India. For IRS and rest group B posts, a candidate must possess at least one of the following eligibility. Or a person of Indian origin who has migrated from Myanmar, Sri Lanka, Kenya, Uganda, Tanzania, Zambia, Malawi, Zaire, Pakistan, Ethiopia or Vietnam with the intention of permanently settling in India. For General category candidate, number of attempts are 4. For OBC category candidates, number of attempts are 7. Similarly for SC/ST candidate, number of attempts is unlimited. Generally UPSC exam is conducted in 3 phases and its notification usually displayed on UPSC website in the month of April and the Prelims falls in June to August. The exam result for the same comes in September to October and the main exam falls in the month of December such that candidates will get their results mostly in February/March. Preliminary Examination (Stage I): It is also called as CSAT exam which consists of objective type question papers i.e. general studies and aptitude test. Main Examination (Stage II): Its format is a subjective type examination, which consists of 9 conventional exams. Interview Round (Stage III): This is the most important round which comes after clearing both above mentioned exams. It is a kind of personality test which takes place in the month of March/April after which final result comes out in May/June. One has to be prepared for all three rounds as small mistakes in these exams can create lot of problems in clearing the exams. All the best and stay tuned with UPSCbuddy.com for latest updates and information on UPSC 2019!